One thing I’ve learned searching out topics for Opposite Day is that it can be very hard to find anything very interesting to choose for a topic. It’s almost criminally easy to have the smallest or shortest something. Hell, I probably could get a world record for shortest attention span some days. That was before I stumbled upon two amazing men with even more amazing talents: Willard Wigan and Dalton Ghetti. 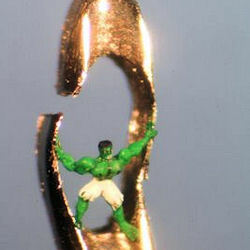 Despite being from two different parts of the world they’ve stumbled upon the same amazing gift of making tiny sculptures. Forget sneezing, don’t breathe! The images above and to the left are courtesy of English sculptor Willard Wigan. The artist typically uses the eye of a needle or the head of a pin. He occasionally uses other media when appropriate, such as a fishing hook for a Peter Pan diorama. 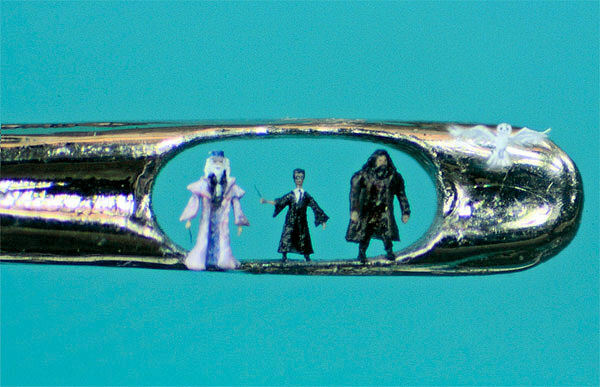 Some sculptures can be as small as 0.0002″ (two ten-thousandths of an inch) in size. For reference, a human hair is 0.0006″ in diameter. Naturally one wonders just how he can make something that small. Wigan uses meditative techniques to calm his breathing and heartbeat. Yes, even an errant heartbeat can mean the instant destruction of hours of work. Most of his tools are hand-made, such as a shard of diamond on the end of a pin for manipulating material. To paint the finished product, Wigan uses a single hair from a house fly. That key wasn’t added, it’s part of the same lead. Dalton Ghetti uses a different media altogether, albeit one we are all too familiar with thanks to school: pencil lead. Ghetti’s is a classic tale of pulling oneself up by the bootstraps. Born and raised in Sao Paulo, Ghetti became fascinated with sculpting things with knives, chisels and hammers. This lead to an interest in carpentry. It also lead to the United States, where he earned a degree in architecture while working as a cabinet maker. This lead to a job as a home remodeler. Still, he never lost his love for hand carving. He started shrinking the size of his art pieces, looking to challenge himself. That eventually lead to him experimenting with pencils. He uses nothing else except a bright light-source, a needle, and an exact-o knife. Some of the most intricate sculptures can take months to complete. 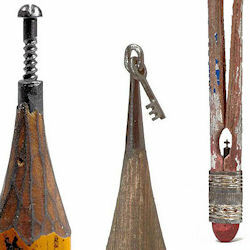 The key pencil in the picture above, as mentioned, is all one piece. Ghetti has made a length of chain out of a single piece of lead since then. Now you have something new to try when you’re bored at work. You’re welcome!